The Lord said to Moses, "Send some men to explore the land of Canaan, which I am giving to the Israelites. From each tribe send one of its leaders." So at the Lord's command Moses sent them out from the Desert of Paran. All of them were leaders of the Israelites. . . . They went up and explored the land. . . . And when they reached the Valley of Eshcol, they cut off a branch bearing a single cluster of grapes. Two of them carried it on a pole between them, along with some pomegranates and figs. That place was called the Valley of Eshcol because of the cluster of grapes the Israelites cut off there. At the end of forty days they returned from exploring the land. They came back to Moses and Aaron and the whole Israelite community at Kadesh in the Desert of Paran. There they reported to them and to the whole assembly, and showed them the fruit of the land. They gave Moses this account: "We went into the land to which you sent us, and it does flow with milk and honey! Here is its fruit. But the people who live there are powerful, and the cities are fortified and very large. We even saw descendants of Anak there. The Amalekites live in the Negev; the Hittites, Jebusites, and Amorites live in the hill country; and the Canaanites live near the sea and along the Jordan." "Or suppose a king is about to go to war against another king. Will he not first sit down and consider whether he is able with ten thousand men to oppose the one coming against him with twenty thousand? If he is not able, he will send a delegation while the other is still a long way off, and will ask for terms of peace. In the same way, any of you who does not give up everything you have cannot be my disciple." We can see what kind of life we have simply by finding out what kind of goals we are looking toward. We do not have to find out what of all our goals are like, since they are countless--as many as our motives and almost as many as the judgments and conclusions we arrive at through our thoughts. But these are merely secondary goals derived from our primary goal, or tending towards it. All we have to find out is the goal that we prefer above all others, and in comparison with which all others seem like nothing. If we have ourselves and the world as our goal, we can know that our life is a life of hell; but if we have the good of our neighbor, the common good, the Lord's kingdom, and above all the Lord himself as our goal, we can know that our life is a life of heaven. It is good to have a vision for our future. That's what the Lord had in mind when he told Moses to send twelve men, a leader from each tribe, to explore the land of Canaan and bring back a report. The Israelites were camped at Kadesh Barnea, only about forty miles from the southernmost towns of the Holy Land. By this time, they had completed the building of the Tabernacle according to the instructions given to them by God at the same time they received the Ten Commandments from Mt. Sinai. With a Law given by God, a Tabernacle in which to worship God, and a leader appointed by God, the clan of Israel had all the elements needed to become the nation of Israel--except a homeland. Now they were sending out an advanced guard to see what that homeland would be like. They were sending out explorers to give them a better vision of their future life. Just as we like to have a vision for our future, the Israelites wanted a vision for their future. They wanted to see if this place they were struggling for and suffering for was as wonderful as God had promised them. And indeed, the report came back that the land did flow with milk and honey (a Hebrew idiom for being rich and fertile), just the Lord had promised. But it also flowed with something else that they didn't like so much: big, strong, hostile warriors and large, strong, walled cities! The land was already occupied, and it was well-fortified and well-defended by those occupants. This wasn't going to be easy! Somehow, it seemed, God had neglected to mention that they were going to have to work for this wonderful homeland that God had promised them. They were going to have to fight for it. And if we read on in the story, we find that they lost heart, listening to ten of the twelve explorers who said the inhabitants of the land were too strong for them, instead of to the two who said that with the Lord's help, they could go in immediately and conquer the land. 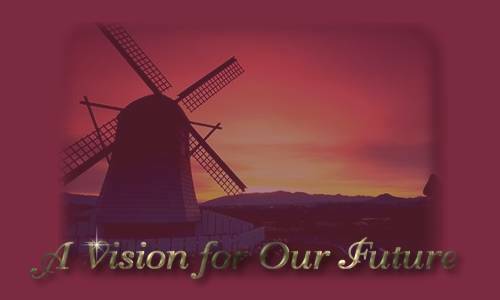 It is one thing to have a vision for our future. It is another thing to be willing to put out the effort to make that vision a reality. It is one thing to have great plans for what we are going to do with ourselves; it is another thing to make the sacrifices and face the struggles that go along with any vision and plan for the future that is worth pursuing. In this church, we tend to focus on our individual spiritual growth--and I'll be returning to that a little later on. But sometimes it is good to broaden our view and consider the wider picture. So this morning I'd like to talk to you about forming a vision for the Swedenborgian Church in Massachusetts. Some of you are aware (and the rest of you will be in a few seconds!) that the Massachusetts Association of our church is in the middle of a visioning and planning process for the future of the Swedenborgian Church in this state. This process began with a Visioning and Planning Retreat at Blairhaven on March 25th, which drew thirty people representing all of the churches in the Massachusetts Association. The retreat led to the appointment of a Planning Committee whose members are Paula Higgins and Alix Williams from the Boston Church, Herb Ziegler and Polly Erickson from the Cambridge Church, the Rev. Andy Stinson from the Elmwood Church, and yours truly from the Bridgewater Church. This committee has been meeting monthly since September, with the task of putting together a plan for the future of our church in Massachusetts. The plan will be presented at the Annual Meeting of the Association next spring. It will then be up to the membership of the Association to decide whether to go forward with it. So far, the Planning Committee is right on track in its timetable for getting its work completed. After discussing the thoughts and ideas of the various members of the committee, and of some other people who communicated their ideas to us, we put together a long list of items that might be included in our plan. Then, at our last meeting, we prioritized those items and came up with seven that were the most important to us. Though everything on the list was good, we recognized that it is important to focus on a limited number of goals so as not to dissipate our energy trying to do more things than we can realistically accomplish. We are now at a stage where we are ready to start asking for reactions and ideas from the members and friends of our churches here in Massachusetts. To provide you with something to focus on in giving us your thoughts, I would like to read you the top seven goals that the Planning Committee came up with at its meeting on November 14. I have also put copies of the whole list on the back table, and I encourage you to take one home with you. And please do give me your own ideas for the future of our church in Massachusetts in person, by phone, by email, or by letter. As you can see, even these seven would give us plenty to do for the coming years. What is most exciting to me about this list is not so much the ideas themselves--after all, everything on the list has been talked about before. Rather, it is the idea that we could come together as a larger body of Swedenborgians and combine our energy to accomplish some of these things! Of course, that's also where the going tends to get rough. It's easy to dream dreams, to conceive visions, to make plans. It is much harder to carry those plans out in the real world. Dreaming dreams and making plans requires primarily mental effort. While that is not always easy, it is far easier than the combined effort of head, heart, and hands that is required to put those plans into practice. Let's tie this back into our Bible story. Think of the Planning Committee as your hand-picked explorers (six of them instead of twelve!) sent to search out the land of possibilities for the future of our church in Massachusetts. It is the Committee's job to peer into the future of the Association and its member churches, and get a sense of the lay of the land that we could now be entering. Does the Association have a future flowing with milk and honey? Can we envision ourselves as a vital and growing church, reaching out to many new people with our inspiring and healing message? It is also the Planning Committee's job to assess the obstacles that we might run into along the way. What could derail us from achieving our vision for the future of the church here in Massachusetts? What are the stumbling blocks, both internal and external, that we might be facing? What is the opposition that we will have to struggle against? After all, as Jesus said in the Gospel of Luke, before we take on any challenge we do have to sit down and count the cost, and decide whether we are up to the challenge. The Israelites who sent out those twelve explorers were not ready for the challenge. Yes, they were happy to hear what a wonderful land it was that the Lord had promised them. But they lacked the faith and the courage to face and overcome the inevitable resistance that goes with any new and exciting venture. They did not believe they could overcome the enemies in the land. And the main reason they lacked courage and confidence was that despite all the miracles the Lord had wrought for them from the time he delivered them out of their Egyptian slavery through giving them water from the rock and bread from heaven to satisfy their thirst and their hunger, they still did not believe in the Lord's overwhelming power to bring about the good purposes of the Divine will. So instead of going up and immediately conquering and occupying the land, they spent forty years wandering in the desert, until all the adults who had lacked the faith and courage to follow the Lord's leadership had died off. It was up to the children of those doubters to go in and claim the land that the Lord had promised them. Perhaps it is wishful thinking, but I like to think that we as a church have already been through our forty years of wandering in the wilderness. For whatever reason, after the early decades of the 1900s, the history of our church in the twentieth century was one of a continual rear-guard battle--and not a very successful one--to hold onto what we had. During that time period, we lost thousands of members, and dozens of churches throughout North America. Now, as the twenty-first century begins, there is reason for optimism that our long decline has at last reversed, and we are poised for new growth. It is too early to tell whether it is a trend, but the membership numbers of our denomination seem to have hit bottom, and have been increasing modestly in the past few years. The same thing is taking place here at our church in Bridgewater. The social climate is certainly ripe for a new resurgence of Swedenborgian beliefs. Never in our memory has there been such interest in angels, the afterlife, and spiritual growth. The fields are riper than they have ever been. Will we be able to send the laborers into that harvest, and reap the benefits of an exciting, vital, and growing church? The answer to that question does not lie only in our ability to work together on such things as the planning process now underway in our Association. Yes, it is vital for us to work together in clarifying and pursuing our common goals as a community of faith. And yet, our success in doing that will eventually come full circle back to the individual willingness of each one of us to follow our own God-given spiritual vision, and to overcome the enemies within our own souls that stand in the way of our moving forward into the promised land of peace, harmony, and common effort with one another. Because it is our own inner enemies that prevent us from working with others who share our beliefs in order to overcome the obstacles that stand in the way of our moving forward as a larger church. So as we journey forward together in our visioning and planning process for the Massachusetts Association, I would encourage each one of you to send out your own explorers to search out the land of possibilities for the next steps of your own spiritual journey. And then I would encourage you to sit down and count the cost. Having seen the bright possibilities for our future, are we willing to put out the effort needed to make those possibilities real? And as you do that, consider how this church--your chosen faith community--could move forward on its spiritual journey in ways that would best support, inspire, enlighten, comfort, and motivate you on your spiritual journey. What aspects of this church are helpful to you just the way they are? And how could the church become even better at supporting you--and those you think may be a part of this church in the future--on the spiritual journey toward our own Promised Land? Yes, there will be obstacles and enemies along the path. We will have to think, feel, and act in ways we have never done before. But if our vision is clear, and our faith in the Lord is strong, we can accomplish God's grand purposes for us and for our church. Amen.